Manchester United disrespected Anthony Martial by handing over his #9 shirt to Zlatan Ibrahimovic, as per his agent, Philippe Lamboley. Upon joining Manchester United this summer, Zlatan Ibrahimovic was given Anthony Martial’s #9 shirt, so as to boost the shirt sales. In return, the Frenchman received the #11 shirt, which was previously worn by club hero Ryan Giggs. 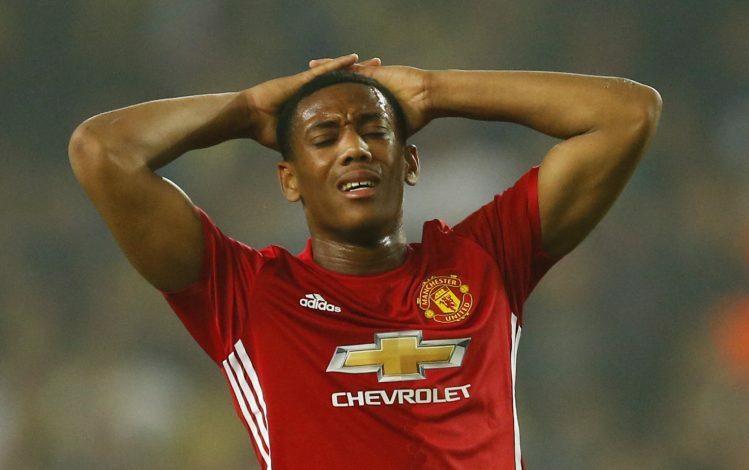 But in spite of receiving the legendary shirt number, Martial was left utterly disappointed and surprised at the club’s decision to do the number swap without his consultation, as per his agent, Philippe Lamboley. Lamboley spoke to RMC Sport about the incident, where he revealed: “I’m not going to lie to you. Yes, it got to him (Martial). Yes, it surprised him. Yes, he was disappointed… for two days. But he’s professional. He knew how to get back into things straight away. But despite the whole shirt number saga, Lamboley has claimed that his client remains happy at Manchester United, and wants to win titles with the Red Devils. “He’s very happy there,” Lamboley continued. “They’re trying to make him look sad because he doesn’t always smile. It’s part of his personality. The people who know him well know that he’s an adorable and welcoming boy. He loves the fans, who welcomed him so well. “He only has one desire, and that’s to have a great season and win titles with United. Let him work, let this young 20-year-old be happy and take pleasure in his work.